Please join us for a very special fundraiser for the Family Nurturing Center of Massachusetts in Dorchester, which supports families by teaching parenting and nurturing skills to parents with newborns on through teenagers. More information about the Family Nurturing Center’s wonderful programs here. 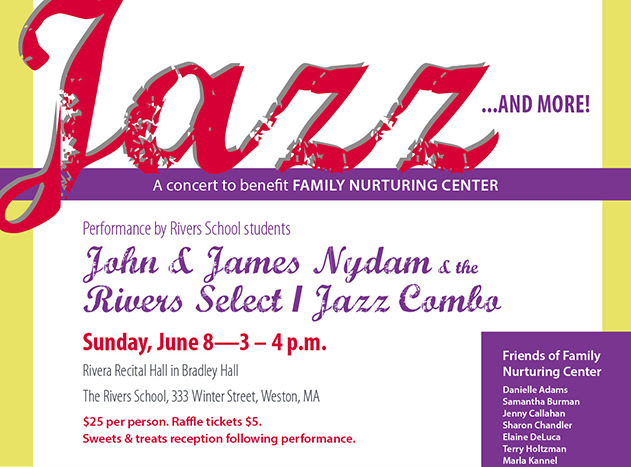 The fundraiser will be a very special concert at the Rivers School on Sunday June 8 from 3 – 4 p.m. There will also be a limited number of beautiful raffle items available. To purchase tickets, and to support the Family Nurturing Center, please go here.